The Halo 5 hype will not stop coming. To finish up their exclusive coverage of Halo 5, Game Informer has just revealed that Master Chief will remove his helmet in the latest entry in the Halo series. 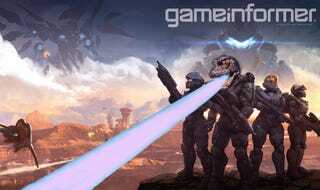 In a shocking twist, Game Informer writes, Master Chief will actually be played by Godzilla. As a result, the Spartan Laser will not be making an appearance in Halo 5—players can hold down the both triggers to shoot their laser breath instead. In addition, Master Chief—whose name has since been retconned to Masterzilla—can now fly with the assistance of Gunnery Sergeant Edward Buck, who has only recently been recast as Mothra. Through the aid of fellow Microsoft subsidiary and chief exporter of shattered dreams Rare Ltd., a new system has been created that allows Masterzilla to carry and equip Gunnery Sergeant Mothra. This enables them to work together and collect skulls scattered throughout the game’s various levels. This, of course, marks the first time that a giant dinosaur monster will play the lead in the Halo franchise.